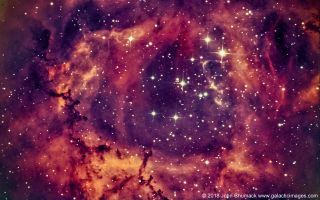 The open-star cluster NGC 2244 shines at the heart of the Rosette Nebula in this deep-space image captured by astrophotographer John Chumack. Happy Valentine's Day… from space! A cluster of superhot stars glows in the core of the Rosette Nebula in this deep-space image by astrophotographer John Chumack. The Rosette Nebula is a rose-shaped cloud of interstellar dust and gas that lies about 5,000 light-years away in the constellation Monoceros (the Unicorn). At the center of the flower's cosmic petals is a cluster of stars known as NGC 2244, or Caldwell 50. This star cluster also contains several rare blue-white O-type stars, which are some of the hottest and brightest stars in the universe. Surrounding these enormous, bright stars are darker splotches known as Bok globules. These small, dense clouds of dust and gas are some of the coldest places in the universe. They appear dark because they absorb the light from the more luminous background. Chumack captured this image from his backyard observatory in Dayton, Ohio, using a ZWO 174-millimeter cooled CMOS camera and a 6-inch Newtonian telescope. You can see more amazing night-sky photos by our readers in our astrophotography archive here.